“Be worried and fascinated by the future”. 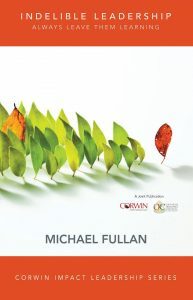 Those are the final few words in Fullan’s “Indelible Leadership ~ Always Leave Them Learning” and those seven words sum up my thoughts as I look towards opening a new school in 2 short weeks. “Wanted…leaders willing to throw themselves into the deep end as they save others and themselves”. Deep Leadership is about “creating things that we never imagined”. As I look towards co-creating a brand new school culture ~ along with staff, students, parents and community members, I can’t help but wonder how we go about creating a school culture where people want to be a part of it ~ not because they live in a specific boundary, but because if they had a choice, they would choose us. “Be right at the end of the meeting, not at the beginning”. This one will be an easy one, as our year will be filled with lots of unknowns which will require discussion, disruption of past thinking and an openness to new and innovative ways of doing things. I will not enter any of our meetings with any predetermined outcomes. We’ll need to come to consensus as a school community. Our mission and vision will be our guiding compass. One of the many things that excites me is learning about how to create a culture from the ground up. What will we use to measure our success? My mind is filled with numerous statements of inquiry. If we are intentional about creating learning environments that meet individual needs then students will be poised for greater engagement and achievement. If we are intentional about building community before delving into content then students will be more likely to collaborate when creating evidence of their learning…. And the list goes on. So much to choose from ~ where to start? “The secret agent is the student”. I truly believe this statement and hence my passion to return to a school and to support a staff as they ensure that our students see themselves as capable, competent and change agents. A school community where voice and choice are the norm and that all community members have access to technology which will allow them to create, to share, to empower and to build upon their natural curiosity. We have been intentional in creating learning environments which look different that the standard rows of desks and chairs. Our students will know from Day 1, that life at Sir Arthur Currie will be different. Our job is to ensure that different = better. I have always believed in the power of being connected to the system ~ but to ensure that it is a reciprocal relationship. The system has a great deal to learn from schools as schools have a great deal to learn from system perspectives and latest learning. There should always be a balance between leading and learning and whether right or wrong, I’m anticipating that this year, the scales will be tipped more towards learning. It’s imperative that our school community embraces the fact that We Are All Learners ~ me included. Although this will be my third school, as a school principal, I do not want to passively do what I’ve done in the past. We expect teachers to “change it up” each year to meet the needs of their new group of learners ~ so should we as administrators. I’m also aware that we’re about to start a new school community with an energetic, dedicated and dynamic staff that will undoubtedly be there much longer than me. So building leadership capacity will ensure that the culture we create from day one will continue long beyond my tenure. So…back to my opening and Fullan’s closing remarks. Worried? Not really! From my initial meetings with the staff, my meeting with some of our incoming grade 7 and 8 students and a few meetings with some of our parents, the Sir Arthur Currie school community will indeed be caring, inclusive, innovative and poised to challenge and engage our students. Fascinated? You bet! The possibilities for a brand new school are endless. The trail has yet to be blazed. As others are enjoying the final two weeks of holidays, I’m anxiously awaiting for our journey to begin. Are you “worried and fascinated by the future?” Come Write with me…..